The seminars for 2018 will retain the same high standards for which 'AWICS' is well known and will include some new and topical subjects. This seminar will explain and examine why and how local authorities are setting up local housing companies and other delivery vehicles. This seminar will explain and examine the government’s proposals and their implications for local authorities, housing associations and their tenants. Social housing is becoming increasingly important in Scotland at a time of rising demand for affordable housing. Terms on which loans are available are less favourable than in the past. The Scottish Government has passed the Housing (Scotland) Act 2014, reformed the Scottish Housing Regulator, ended the ‘Right to Buy’ ended in Scotland on 31st July 2016 and is promoting and funding an ambitious development programme. The Scottish Housing Regulator’s new approach emphasises ‘Value for Money’. The United Kingdom government is ‘reforming’ welfare with significant implications for Scottish tenants and landlords but some welfare powers have now been devolved to Scotland. Scottish local authorities and housing associations therefore face significant challenges, not least the need to meet the Scottish Government's aspirations for development. This seminar provides an introduction and overview of this important subject. We are holding seminars on ‘Developments in Local Authority Housing Finance’ in July and October 2018. This seminar looks in depth at current developments in local authority housing finance in England – especially the implications of government policies, public finances, rent policy, welfare reform including universal credit, the reinvigorated ‘right to buy’, the funding of supported housing including the sheltered housing rent, the homelessness reduction act, the flexible homelessness reduction grant, the affordable housing programme (including the new funding for social housing), the selective raising of the borrowing cap, the social housing green paper, local housing companies (what they can offer, how to establish them and how to set one up) and new development. 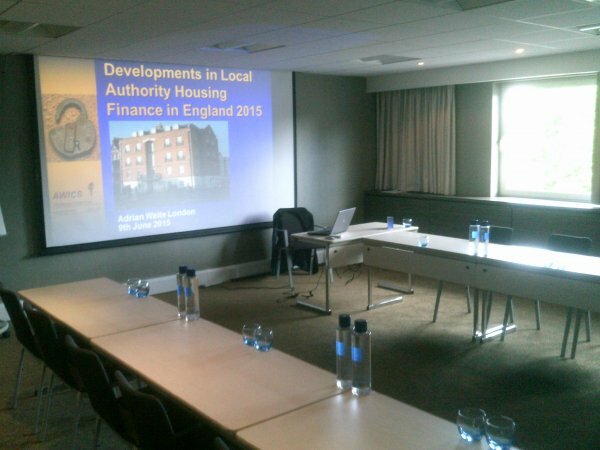 This seminar considers social housing finance in the local authority and housing association sectors including the issues that are common to both and the issues that are specific to one side of the sector. It is designed for people who are not experts in housing finance, but who need to understand the basics and achieve an overview of what is going on. It is fully up to date with all developments. It refers to rents, service charges, development, sources of capital funding including grants and borrowing, housing benefit, welfare reform, business planning and much more. Many people have already benefitted from this seminar. Whether you are in a Housing Association, Local Authority or the Welsh Government; whether you are a Housing Manager, Tenant Representative, Elected Member, Board Member or even a member of the Housing Finance Team, you could also benefit from attending our seminar. An AWICS seminar about to start at the Conference Centre at the Novotel Hotel (Waterloo) in London. To make enquiries about seminars please contact us at enquiries@awics.co.uk or 017683-51498.